With nearly 6,000 members competing in more than 100 tournaments, the American Junior Golf Association (AJGA) provides high-level competitive opportunities for the best junior players in the country. The organization also has instituted an aggressive pace-of-play policy that has reduced the duration of the average round by 14 minutes – the approximate time it takes to play an entire hole. 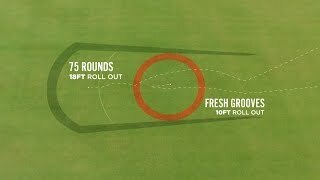 For 2013, the AJGA has set a goal of four hours and 19 minutes for the average length of a round, down from four hours and 35 minutes in 2008. To achieve this standard, the AJGA uses several policies. For each of its tournament courses, the AJGA has set a time par, which is the expected duration for juniors playing competitively in threesomes. Some of the factors that influence time par include the size of the field, tee-time interval, green-to-tee distance and green speed. There are six checkpoints during a round – one every three holes. 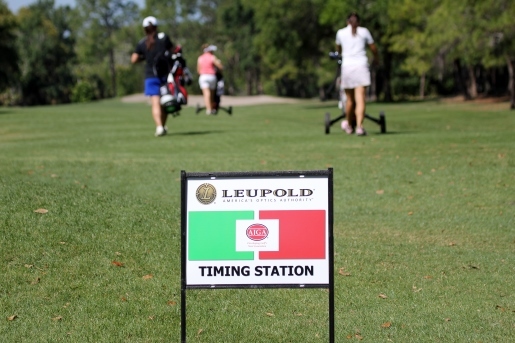 In addition to clocking players against the time par at each checkpoint, volunteers measure a group’s position relative to the group in front, an interval known as gap time. At the first checkpoint, the players in the group receive a green or red card. A green card means the players are within the time par or in position against the previous group. A red card means the players are both behind the time par and out of position. By the next checkpoint, three holes later, the group can earn a green card by either regaining position with the group on front or coming in under the time par. Alternately, players will keep their red card but avoid a penalty by gaining one minute against time par. If the group fails to meet any of those conditions, the players receive a double red card and a one-stroke penalty. After a double red card, individual players may receive additional penalties after recording multiple bad times. A double red card is a rarity; a single red card is usually sufficient to spur players back into position. In 94 tournaments during 2012, the AJGA handed out 3,235 red cards. Of those, officials assessed just 29 penalties. AJGA competitors also play ready golf for the entire round, even off the tee. On every green, the first player finishing the hole must walk ahead to the next tee and prepare to tee off, no matter who has the honor. After introducing this policy in 2011, the AJGA reduced its average round duration by 10 minutes. The players quickly have adjusted to the policy and have found that good shots and better pace of play are not mutually exclusive. Rinko Mitsunaga, 16, received a one-stroke penalty at the Exide Technologies Junior Open presented by Mizuno earlier this year. Afterward, she spoke with the AJGA staff about how she could play faster. The following week, she not only improved her pace of play, but also her level of play, winning the Brian Harman Junior Championship. “I definitely learned how to play faster and that it’s not necessary to take as long to take each shot because the results are the same,” says Mitsunaga, of Roswell, Ga. “Even when I’m not playing an AJGA event, I am still using the policy because I want to play faster.